When I was a teenager I loved to wear sneakers. I don't mean just for comfort. I wore sneakers for a statement. I owned Jordans, Airmax '95, etc. It was a collection that I couldn't add enough to. Fast forward to my adult years and I have replaced that fervor with other fashionable collections (jewelry, high heels, bags, etc.). Though I wouldn't call myself "cool" by any means, I love the casual but chic vibe sneakers can add to an outfit (more inspiration for how to wear trainers on Vanessa Jackman's blog). Many may call it odd, unfitting or even perhaps sloppy but, there's no doubt it's a statement. What do you think? Do you wear sneakers to your outfits? I love this look! Those sneakers are super cute! Love the casual chic outfit! The floral jacket is super cute. love that printed jacket! so cute! i don't wear sneakers a ton but when i was in high school i definitely had a few pairs i rocked all the time, and whenever i wear a pair now i am reminded how glorious sneakers are! 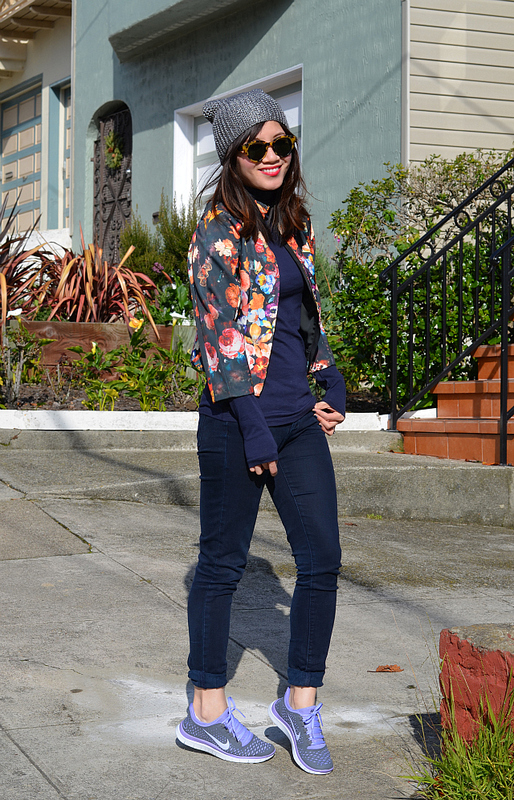 this is a super cute look – love that little jacket. I never wear sneakers but they look good on you :) The jacket is amazing! cute sneakers! I never really wore sneakers because my feet are so big I thought they made my feet look even bigger! hahah! you pull them off well! I love the jacket, great! LOVE this look! i definitely rock sneakers all the time - so comfy. I have never been in a sneaker person in my whole life (probably because I'm short), but I just got a pair of Nike Frees and I LOVE THEM! So much! I wish I had gotten yours though...mine are the same purple base but then neon green. When I ordered them I thought it was a mint green. Nope. It's neon. While I don't necessarily think I'll wear them out with jeans, etc. I've definitely started wearing leggings and big sweaters more often so that I can wear my nikes. I love them. such lovely and comfy shoes! I do sometimes especially when walking Mr K - I think if you rock them you rock them if you know what I mean - love this look on you! oh my gosh this is too cute! I'm not usually a sneaker person, but I LOVE my Nike Frees! They are neon and super fun (and comfy!) Yours look fab with that outfit! Hi dear, love the gorgeous floral blazer/top, looks fantastic, great look! 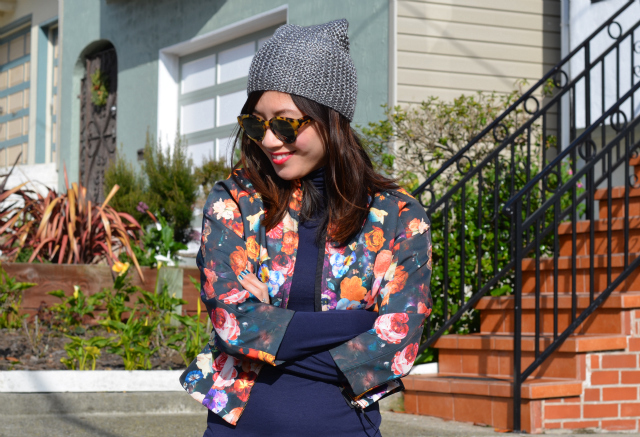 I love how you made that floral jacket more casual! I love these cool sneakers and how you rocked them with your cute outfit. I totally need to find the perfect pair of sneakers like these! 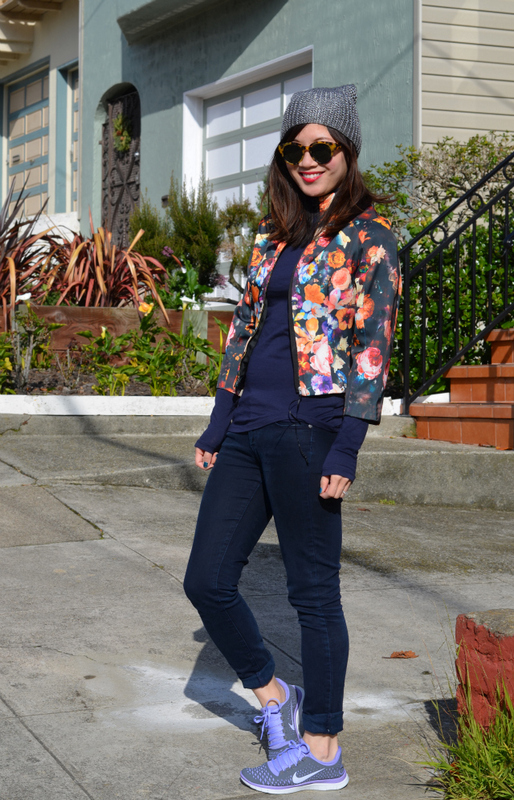 nothing quite like rockin a pair of sneakers with a floral blazer! love this lady! i'm in need of a new pair. 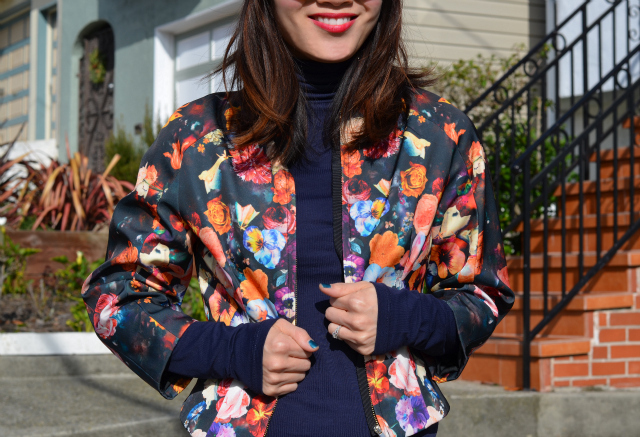 love yours and your floral jacket. Thanks for stopping by my blog! 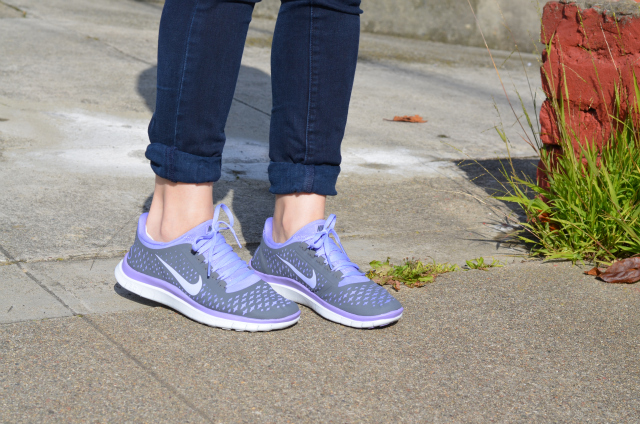 I recently picked up a pair of purple nikes too (twinsies!) I would never have thought to wear them like this. Are they comfy? I've yet to break mine in. I actually just, a couple weeks ago, bought a fancy pair of sneakers to wear with normal outfits...I am not typically a sneaker wearing girl, but started needing the comfort for all the walking I do here in Europe. I love how those ones you are wearing look with your outfit. I def think if they are chic they can be worn with a nicer outfit. Also, to answer your question...my experience with Sheinside is just fine...I mean they have a slightly wonky way of showing the size of the sweaters. I am expecting another order from them soon, so I will know more if all is well with them.